For the best view of Taipei City, make a hike to the top of Elephant Mountain! Also known as the Nangang District Hiking Trail and Xiangshan (象山), the hiking trail is located close to the Xinyi Shopping District and Taipei 101. The best time to hike the mountain is during late afternoon, this way you can catch the sunset as well as a daytime view and stunning nighttime view of the city, however the trail can get relatively crowded during the weekend. The hike takes a total of around 15-20 minutes to the top, and includes lots of stairs! Remember to take a left at the fork in the path. After around 8-10 minutes, there will be a landing area with facilities and restrooms where the path branches off in multiple directions. From the base of Taipei 101, walk east on Xinyi Road (信義路) for two blocks until you reach MRT Xiangshan Station, only a 15 minute walk from 101 and completely worth it. To get there faster, take a YouBike from the station across the street from 101 (MRT Exit 2), then return the bike at the park nearby the trail entrance. After arriving at Xiangshan station (象山), the terminus of Red Line 2, leave from Exit 2 and continue walking alongside the edge of the park. At the end of this road, take a left and follow until the entrance for Xiangshan Hiking Trail (象山登山步道), total 650 metres, around 20 mins. The closest station is located along the street next to the park at the base of the trail. Another station is located across the street from Taipei 101. That picturesque photo you always see of Taipei City? This is it! The closest night market area to Elephant Mountain is the Tonghua Night Market (通化夜市, nearby Linjiang Street). To reach this night market from the base of the mountain, walk west for 25-30 minutes on Xinyi Road (信義路) and make a left turn onto Tonghua Street (通化街). Alternatively, take the MRT red line 2 stops to Xinyi Anhe (信義安和) station. At the base of the trail and the edge of the park is a YouBike station, a public bicycle rental system that is easily rentable using an Easycard. From Elephant Mountain (Xiangshan), you can easily continue on to Tiger Mountain and 9-5 Peak, two renowned trails in Taipei City. 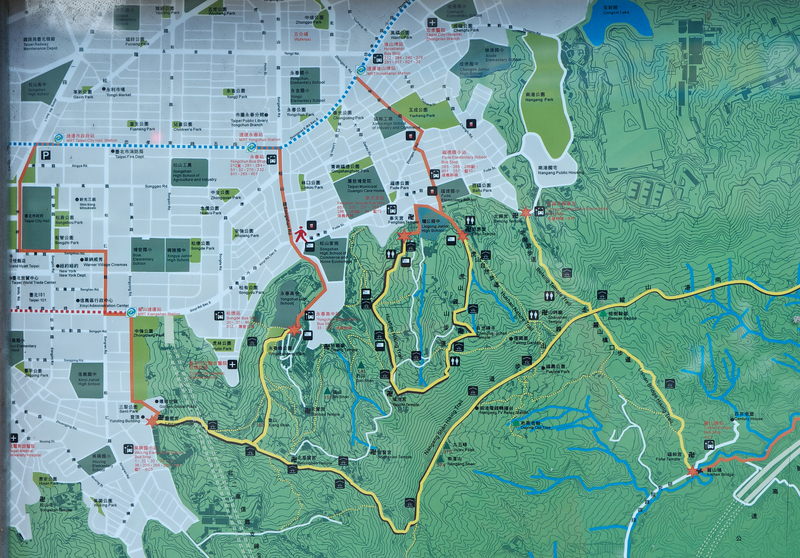 For a more detailed map of hiking trails in Taipei City, check here. This mountain may be referred to by the following names: Elephant Mountain, Xiangshan, Mt. Xiang, Mt. Siang.